Hannah Lyman, the first Lady Principal of Vassar, doubted that dancing was in accord with Christian principles and before she was hired, challenged President Raymond about the propriety of students dancing. As recorded in his Life and Letters1, while President Raymond was forming his initial college administration in January 1865 and considering the candidacy of Lyman for the position, she brought up the question of his attitude towards dancing. Handling her discreetly, he confessed that he had never before had to make up his mind about dancing, it was outside his sphere, and therefore an open question with him. They let it go at that time. In spite of Lyman’s lack of enthusiasm for dancing, a few years after the college opened recreational dancing sometimes occurred in Main Building’s ‘J Parlor,’ one of the parlors leading from the twelve-foot wide second floor central corridor. The wide corridor had been explicitly planned by James Renwick, architect, at the wish of the founder, to encourage student winter exercise. During the same period in the Calisthenium and Riding Academy, the college’s first gymnasium, (see listing of Vassar Firsts) which opened in 1866, the physical education instructor, Delia Williams, required all students to participate three times a week in classes which included aesthetic dancing to music, as well as other forms of Swedish calisthenics then recently introduced to the United States. The New England spa of Dio Lewis apparently served as a model for Vassar’s vigorous physical education program, as advertised in the 1865 Prospectus written by Raymond. 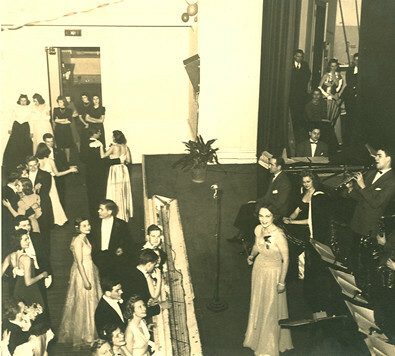 The Junior Prom in 1940. Can you spot the future Vassar Historian? After these various beginnings, it is no surprise that as the century went on, dancing of all kinds persisted at Vassar in spite of a latent reticence in the early administration. In the year 1892 on April 29, Founder’s Day, students promenaded in the corridors, but no dancing accompanied the promenade. In subsequent years, dancing proms turned up as a featured celebration of the Saturday following Founder’s Day, But according to the New York Post of 1911 (as given in the Vassar College Scrapbook, 1911,p.325) “The dance, which was formerly held the Saturday after Founder’s Day, has been abolished, as this affair has interfered with the more serious celebration.”(See Ways of Celebrating Founder’s Day, Past and Present) Consequently, a month later in February-- perhaps as a kind of protest against rigidity—(there was still a lady-principal at the social helm), the college’s first Sophomore-Junior Dance took place. (Scrapbook, idem.) The dance was a dinner dance, and ‘dance orders’ were programmed. A formal reception was held from four to five o’clock “for those who wished to dance as much as possible.” Then at five, the programmed dance began. Supper was served in the corridors outside the dining room. Not to be outdone, the Seniors held a dance on June 2, at which they also used dance cards. Students of Vassar history can surely guess that the year of strong administrative encouragement of proms would be 1915, when Henry Noble MacCracken became president. James Monroe Taylor retired in 1914, and the trustees allowed the faculty to run the college while they were searching for his successor. The trustees believed Henry Noble MacCracken, a scholar simultaneously teaching English at Smith College and Yale University, exactly filled their bill, and it never occurred to them that he might not continue the old-fashioned Victorian practices of his predecessor. They were wrong. MacCracken, thirty-four years old and immersed in the pre-war changing ideas about student culture, came to the college as president six months in advance of his inauguration in October, 1915. During those six months he allowed many changes in student life, encouraging the students who had been desirous of forming a Suffrage Club and a Socialist Club to do so, and accommodating many other pent-up student demands. Surely the junior prom that took place in February, 1915 represented the same kind of student victory as the clubs, although it has not been written down as such. The Junior Prom that year was the chief social event of the college year according to the 1915 Scrapbook. “It was the only dance to which the juniors [were] allowed to invite their male friends.” It included a grand march for the first time, with the president leading the way. MacCracken’s administration, which lasted from 1915 to 1946, embraced two world wars and interruptions to normal social events, including both junior and senior proms, sometimes occurred during these periods. For example, according to a search made by Frances Goudy, Head of Special Collections, and Eleanor Rogers, her assistant, in 1976, the photo archives contain formal junior prom photographs for 1917, 1921, 1927, 1931,1934, 1938, and 1941 and formal senior prom photos for 1916, 1919, and 1926. The junior proms of the thirties and forties, held in Students’ Building, kept to a pattern and were received into Vassar legend. The most popular debutante New York orchestras, including Glen Miller and Tommy Dorsey, fitted the Vassar Junior Prom into their schedules. Often popular singers in the class sang along with the orchestra. The Prom in 1938 had 218 couples, one of the “biggest events in prom history.” The prom was always held around Washington’s birthday weekend, and expectation for the event was keen throughout the preceding fall. The sister class (freshmen) and other members of the college community stretched their heads over the balcony railings above the dancers, and took the prom in. Often as in Moravia’s account, some students would take off for a roadhouse after the prom was over. Of course, there was a lot of misery over coveted dates who didn’t make it, or blind dates that didn’t pan out. With the pressure of world events during the sixties, the custom fell into disuse. During the seventies, dances, Grand Marches, and dance cards were brought back on the campus. But now the whole student body joined in,-the dance was not a junior exclusive. A prom, Printemps in Paris, was sponsored by the student organization V.I.C.E. in 1988 in honor of the Sr. Class. In 1999, an affair in which the E.M.Ts were called upon to take over-celebrating students to the local hospitals resulted in an examination by the students of what went wrong and what should be done about it. 1.The Life and Letters of John Howard Raymond [edited by his eldest daughter],New York, Fords, Howard & Hulbert, 1881, pps. 555 ff. 2. There is a folder 24.29 in Special Collections Subject Files devoted to miscellaneous information about proms. I am especially indebted to the anonymous author of the publicity pamphlet about the event, which did a good job looking into the record and to Frances Goudy and Eleanor Rogers (mentioned in the text) who helped the pamphlet author dig. Through Moravia’s eyes, we see how the event looked to an Italian visitor who unexpectedly attended a Vassar Junior Prom.